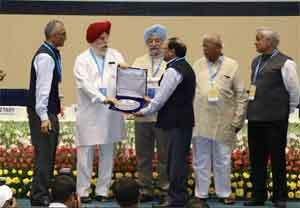 New Delhi: The Ministry of Health and Family Welfare has received the best department award for its contribution during Swachhta Pakhwada, an inter-Ministry initiative of Swachh Bharat Mission, under the Ministry of Drinking Water and Sanitation. The Health Ministry observed the Swachhta Pakhwada between February 1-15, 2017. According to an official statement here, the award was presented to the Ministry yesterday, on the third anniversary of Swachh Bharat Mission. Secretary of HFW C K Mishra received the award on behalf of the Ministry.Swachhta Pakhwada activities were organized and observed within the Ministry offices, in Central Government Hospitals and in public health facilities of the states across 36 States/UTs. The activities included mass awareness initiatives like rallies, street plays and painting competitions, apart from leveraging support of public representatives, NGOs, school children and the community. During the Swacchta fortnight, all hospitals/clinics were directed to install waste bins for segregating waste, while cleaning drives were undertaken in all wards and premises of the hospitals. The Swachhta Pakhwada culminated with the inspection and a special sanitation drive undertaken by Minister for Health and Family Welfare J P Nadda on February 15.